Insect eating bats will eat thousands of insects a night, therefore acting as fantastic pest controllers. Not only benefiting humans directly by easting midges and mosquitoes, but also indirectly by keeping insects away from crops. Agricultural pests cause significant losses to crops worldwide. Bats act as a natural predator control, thus saving money not only through a reduction in lost crops but also because they reduce the need for pesticides. All UK bats are insectivores, feeding exclusively on insects. Over 500 plant species rely on bats as pollinators. These include cocoa, banana, mango and even agave which is used to make tequila! Plants pollinated by bats produce pale nocturnal flowers, that are often large and bell shaped. In some countries bats act as important plant and tree seed dispersers. For instance fruit eating bats carry seeds in them as they digest the fruit, often excreting the seeds far from the original tree. Through this they can help restore and enrich important ecological habitats such as rainforests. Guano deposits in caves provide the energy to sustain thousands of unique life forms. It is also harvested in some developing countries to be used as fertiliser. In places like Thailand, careful protection and management has led to bat guano being a big and sustainable business. There are 18 species of bat in the UK (that’s over one quarter of all British mammal species! ), with 17 species known to breed. Bats are unique amongst mammals, as they are the only group to truly fly – squirrels and possums can only glide for limited distances. 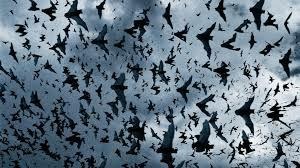 Most bats, including all of the British species, are insectivores, and do not feed on blood. Britain’s most widespread bat, the common Pipistrelle, can eat 3,000 midges per night. Overseas, fruit and nectar feeding bats perform a vital ecological role by dispersing seeds and pollinating flowers, with many tropical plants entirely dependent on bats. Like many creatures, bats are suffering as natural habitats such as hedgerows, woodlands and ponds have been declining and fragmenting. Many bat species roost in buildings and so are extremely vulnerable to the activities of humans. Bats in buildings are under direct threat if they are present whilst works are under-way, or if a demolition is taking place. Bats may suffer injuries, abandon babies, or even be poisoned by toxic chemicals used for timber treatment in loft spaces. Also, the use of pesticides and intensive farming practices have lead to a reduction in the abundance of insects which the bats rely on as their only food source. More recently, it has been suspected that wind turbines may adversely affect bats, as pressure changes around the turbine blades are believed to cause fatal lung injuries. This is a theory that requires further research, in a time when green energy is becoming increasingly widespread. It is important that we create new suitable habitats and manage and enhance existing habitats to aid in the recovery of bat populations in our towns and countryside. Due to their decline, all bats are protected by law, and it is illegal to damage, obstruct or destroy a bat roost, or to disturb, capture, injure or kill a bat. If you would like to know more about bats, information can be found on the Bat Conservation Trust http://www.bats.org.uk and on the Total Ecology site www.totalecology.com/bat-survey/.